This apartment building off Telegraph Avenue still carries a sign of it's earlier incarnation. Its subsequent owners must have wanted to preserve something of its history. Amazing artifact of a previous age. 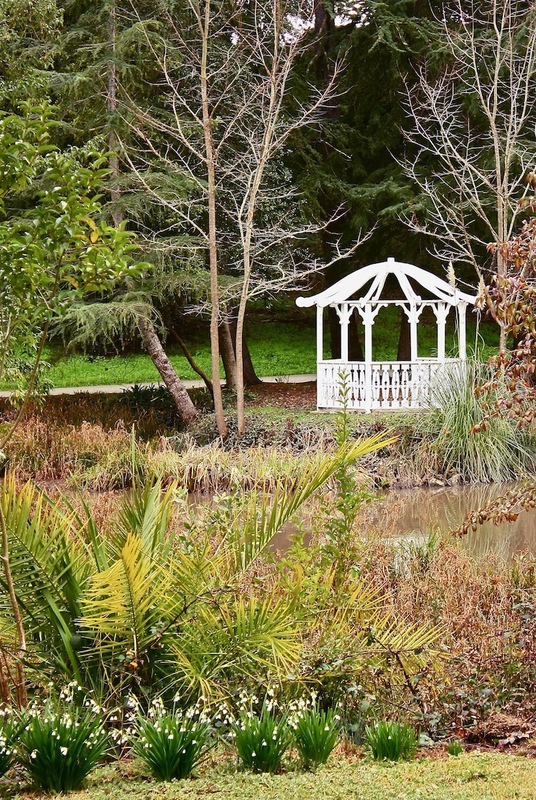 This lovely gazebo is found on the grounds of the Dunsmuir House featured a few weeks ago. The pleasant grounds are another reason Dunsmuir House is a favorite spot for weddings. Linked to ABC Wednesday. Around the corner from yesterday's mural are these two Victorian houses. 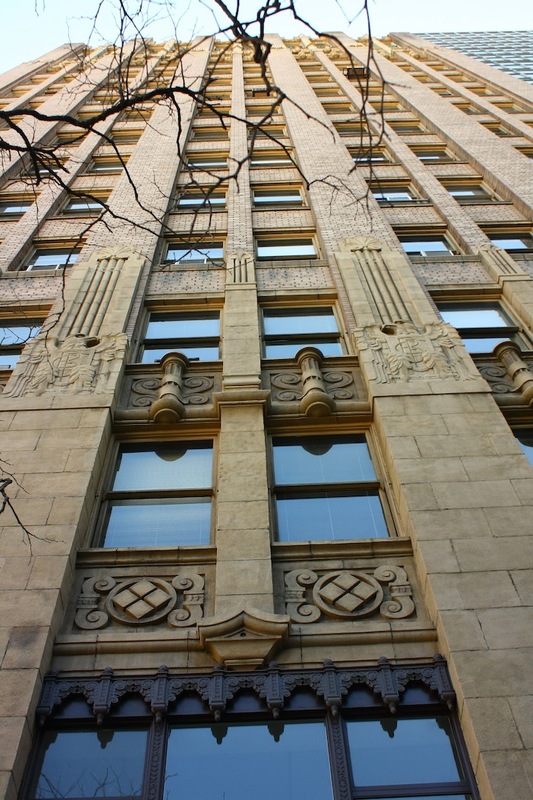 Although they are now duplexes, they retain their classical features and elegant lines. They both need refurbishing but are still beautiful pieces of turn of the century architecture. Oakland continues to have a huge number of Victorian-era houses still in use. 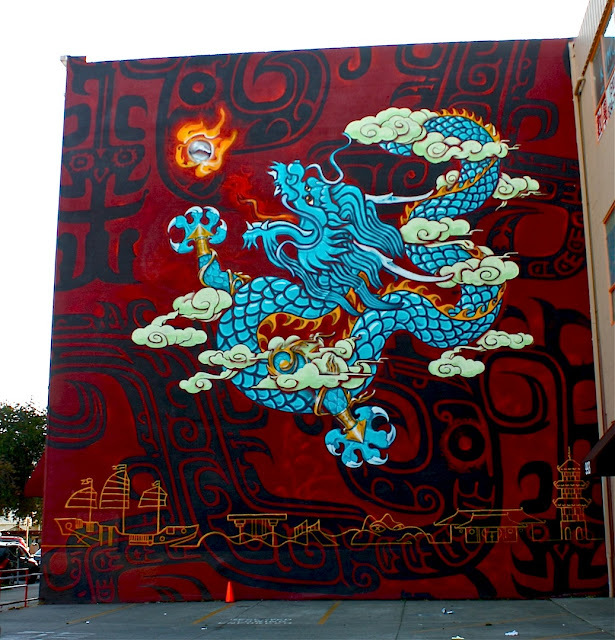 This very cool three story mural is found on 10th Street in Chinatown. I really like the composition. Unfortunately, I couldn't find a title or signature. 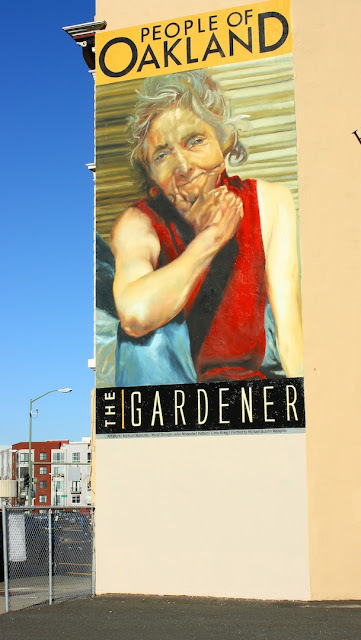 Addendum: Thanks to Gene of Our Oakland, here's the story behind the mural. While out and about I watched kids play at a playground in Chinatown. It wasn't until I really looked at the play structure that I realized it's design is based on a Chinese junk ship. Duh. Except for a day of rain on Tuesday, we've had mostly clear skies since Christmas. Linked to Skywatch Friday. The Oakland Museum presented a multi-faceted celebration for the Lunar New Year. There were many activities for children, Chinese dances, calligraphy and ichibana demonstrations, taiko drummers, and this mochi pounding ceremony. Happy Lunar New Year to all. A new mural has appeared on the Haley Law Offices building in downtown. Created by the Manentes, a father and son team, this is the second in a series on homeless folks. Their previous work, which they painted over to create this one, was The Carpenter. I find their work to be incredibly sensitive and beautiful. It really makes you look into the eyes of people you might otherwise ignore. How I wish they could find more canvases in order to preserve each piece they create. Labels: downtown Oakland, Monday mural, Oakland artists, San Pablo Ave. The tower you see is part of the new eastern span of the Bay Bridge. The erector set behind it is the original span which will be in use until September. The new structure will be the world's largest self-anchored suspension span. It will no longer have two decks and it will also include bicycle lanes. It's only been in the works since the big earthquake of 1989 and is the most expensive public works project in California history. The span runs from Oakland to Yerba Buena Island; the western suspension section runs from the island to San Francisco. This picture was taken from Treasure Island (built on soil dredged from the construction of the original bridge which opened in 1936) looking east to Oakland. The sky shows you the weather has been clear and dry. Linked to Skywatch Friday and Weekend Reflections. Found on a sidewalk in East Oakland. Happy Valentine's Day. 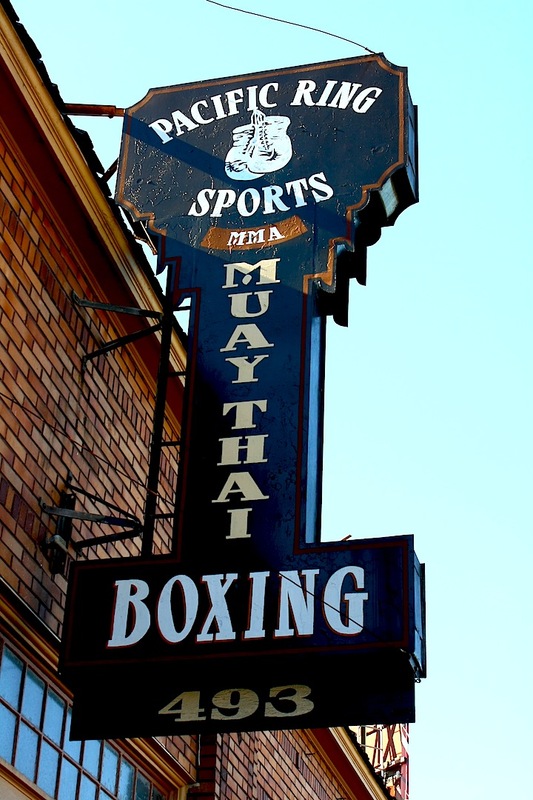 If you drive by this gym you'll see all kinds of martial arts being practiced across the day and well into the evening. 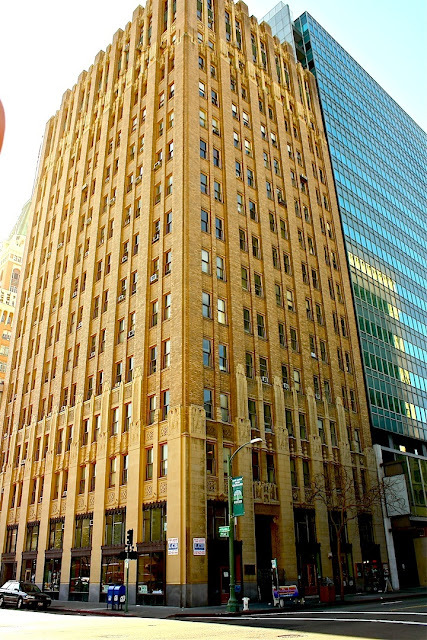 I'm especially fond of the building and the old timey style of the sign. It's amazing what you can find when you leave your well traveled routes. Found this Jules Verne octopus painted across the front of this apartment building. One of the residents told me it's been there at least 3 years. Couldn't find a name or date. This is found off Telegraph Avenue and 38th Street facing the MacArthur freeway. Labels: Koreatown, Monday mural, Telegraph Ave.
Automania has some pretty funny stuff around their building. Their motto is Rust in Peace. Presumably with laughter on their lips. Located in Jingletown and always worth a visit. Dunsmuir House was built in 1899 on 415 acres in a small valley in the Oakland hills. 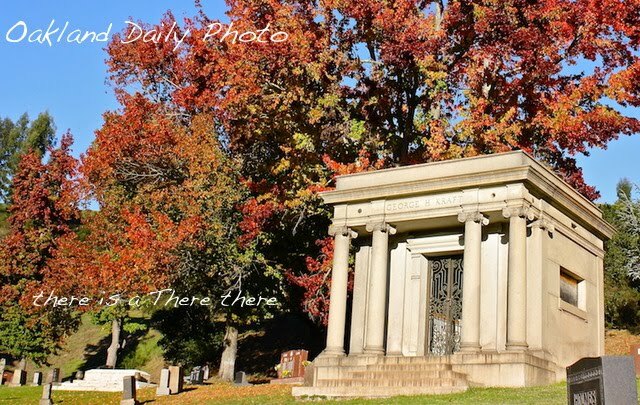 Alexander Dunsmuir, heir to a Canadian fortune in coal and lumber holdings, built the home for his bride. The mansion, designed by San Francisco architect, J. Eugene Freeman, is an example of Neoclassical-Revival architecture popular in the late 1800s. The 37-room mansion features a Tiffany-style dome, woodpaneled public rooms, 10 fireplaces and inlaid parquet floors within its 16,224 square feet. Servants quarters in the house are designed to accommodate 12 live-in staff. Within two years of their marriage they both had died. A daughter by an earlier marriage sold the estate to the Hellman family which used it as a summer residence for 50 years. The estate (now only 40 acres) is now owned by the city of Oakland and managed by its Parks and Recreation Department. A nonprofit group is dedicated to the restoration and maintenance of the house and grounds. 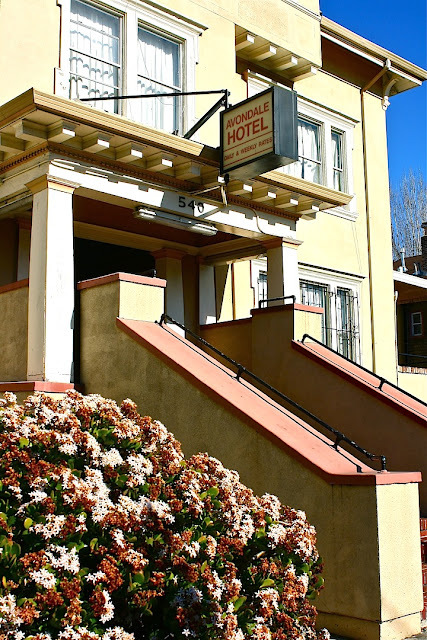 The Dunsmuir mansion has been designated a National Historic Site by the United States Department of the Interior and both the mansion and the Carriage House have been designated Historic Landmarks by the City of Oakland. Linked to ABC Wednesday. Don't ask me why a place called the Leaning Tower of Pizza would have a mural of Venice; but it is what it is. Hey, it's all Italy, right? It's a fun canvas in a lakeside neighborhood that primarily has apartment buildings and private homes. This mural, done in 2001, is in the neighborhood where most of the gnomes live. 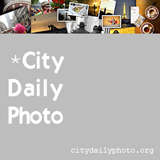 Today is City Daily Photo's monthly Theme Day. Because I'm so literal, I'm posting the only umbrella photo in my archive. Paper umbrellas are fragile, colorful, and charming. Taken at the 2012 White Elephant Sale. For more umbrella interpretations from around the world, visit City Daily Photo.